Small violins can be a bit of a problem. In the past makers and manufacturers had their own definition of smaller violins and two small size violins from different sources could be quite variable in size. Fortunately now that most violins are mass produced, some standardisation has taken place and now, small size violins, even from different makers, have very similar dimensions. 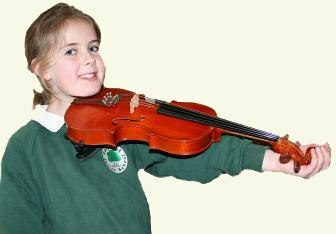 We can't stress enough the importance of your child having the correct size violin. Having one that is a bit too big can really slow a young persons' learning and may even put them off playing completely. A picture is worth a thousand words!. The child to the left is holding her violin under her chin as if she was playing it. She then extended her left arm and can comfortably hold the scroll in the palm of her hand. Her violin is the correct size. If you don't have a violin to try you can get a good idea by measuring from a point at the neck where the violin will rest to the junction of the palm and the fingers with the arm extended. The lengths and sizes are listed below. Please note that the age range depends very much on the size of the child, some youngsters are tiny at 9 or 10, some are much bigger at 5 or 6. If in doubt measure the length of the arm and get a second opinion from the teacher. There are other sizes of violins, 1/64, 1/32, but they are really so small that they seldom appear on the market and are more like toys. Also 1/10, 7/8 and 15/16 (Ladies Violin) but they seem quite rare and are more difficult to purchase. Most children grow out of a small violin within a couple of years, which is why many parents rent the smaller instruments and wait until their budding Pagannini is big enough to play a full size violin before they purchase an instrument. Check our rental terms & conditions.